The book was created by Bev Allen, Langley, British Columbia, Canada in December, 1998 after a trip to Cancun, Mexico. The Text pages are Carlyle Japan paper and each signature is wrapped in paste paper made in a class with Jean Formo at Soundings, the 16th International Conference, 1996. 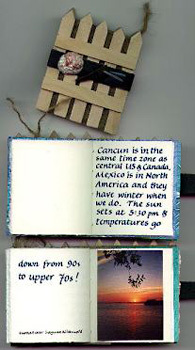 The book was bound with tree tape on handmade fences, made from popsicle sticks. The seashell on the front of the book is from the beach in Cancun. The photographs were taken by Bev and Erin Allen and reduced by colour photocopying.